In the past few days of tracking my habits and assigning them point values, I have realized that there is one major thing that has given me a slight advantage with this eco-challenge chapter. I live on a sailboat. I know I mentioned this in my last post but I feel that it’s relevant to return to and reflect upon this singular choice. The Cap and Trade game has asked me to look very closely at the multitude of choices that I make every day and how they all effect our environment greatly but I have realized that making this one larger lifestyle choice has really given me a head start on easing me into making more enviro-friendly choices. Months before starting Living Chapters, I decided to move aboard, free of any writer’s demands or suggestions, I wrote this particular chapter myself not knowing at the time that it would change the fate of my future chapters. Unlike most liveaboards, I did not make this choice because I am a sailor, or have any attachment or history with boats or the sea. Although I have a strong love for being on and near the water, my reasons behind this decision were pretty practical. We all have our priorities and make mental lists of what we want when choosing a home. This is what my list looked like when making my last move. Trying to accomplish these simple requests in Annapolis is nearly impossible with a non-profit part-time salary. And after a month into my Craigslist housing search, I was almost ready to give up. I had seen way too many over-priced apartments and condos and met a large cast of potential future restraining orders – I mean potential roommates. The idea of living on a boat did not really enter my mind until I answered yet another random ad on Craigslist. This one was advertising a motor boat for rent, $450. Hmm..? Sounded like an interesting idea. Well it was an interesting idea but not a good idea. After arriving at the marina, I found that the guy who placed the ad and owned the boat, Jerry, wanted me to pay him $450 to live with him on his musty, rusty 35ft boat. Anyway, not to get off track here, telling my house hunting horror stories, but I had to give a shout out to Jerry because he may have changed my life forever. I did NOT end up moving in with Jerry and his collection of fishing gear and old boat parts, but meeting him did solidify two things. 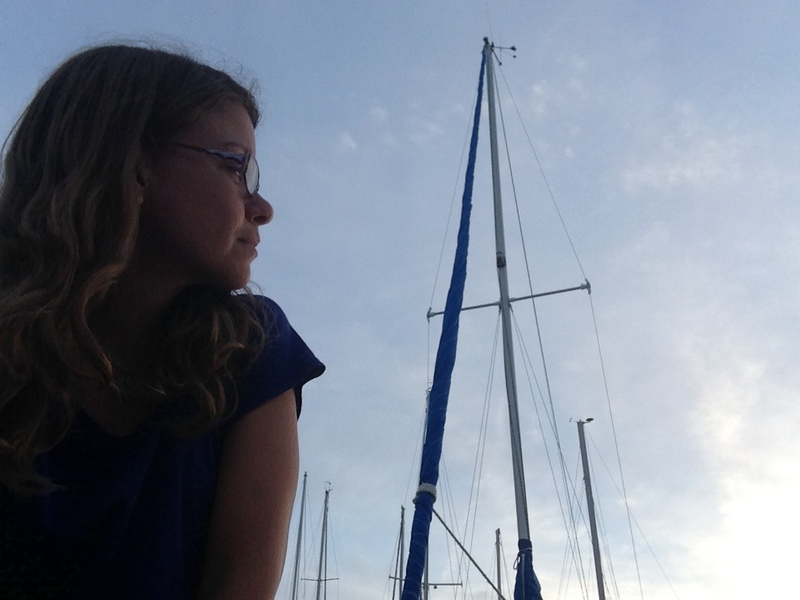 I definitely wanted to live alone and I was even more curious about living on a boat than ever. I knew living on a boat would change my lifestyle but didn’t really consider how it could change my environmental habits. I have to start off by saying I really know very little about the liveaboard lifestyle. I’ve only been aboard 5 months now, which is long enough to know that there is A LOT to learn and there are a million different ways to choose how to live on the water (as there are on land). What I do know is this – I had to change quite a few things to adapt to this new home and the predominant theme for me was reduction. “Less is more” is the mantra, right? Well let’s count the ways living on the boat has helped me practice this. Less space = less stuff = less waste. The first thing I adapted to, was living in a much smaller physical space. It really wasn’t that hard. With less space, I just prioritized and brought aboard the things that I really needed to live with along with a few things I really wanted. I quickly realized that there were a lot of belongings I thought I needed but really didn’t. Isn’t this alone the crux of so many of our consumption issues? We think we need more than we really do? Desire more – use more. Desire less – use less. It seems simple but sometimes hard to put into practice. For example: at the grocery store – I now, choose things with less packaging. Why bring home the extra foam, plastic covering, or extra plastic bags when there is really little room to store or dispose of these things when returning to the boat. Do I need an extra plastic bag to put my ears of corn in or loose vegetables – no dont think so? My trash bin on land was twice the size of the one I have aboard so keeping extra trash was not a big deal in my personal life. I also don’t have ample space for recycling now – so I just try not to bring back any excess packaging when I don’t have to. I also have gotten into the habit of buying only what I need to eat for the day that I am going to eat it (with a tiny fridge there is no room to keep excess food) This has helped me eat fresher food and also reduces my food waste. I eat what I have on board before going and buying more. Less space also = less energy usage. On the first boat I lived on, I used a refrigerator smaller than a dorm room fridge, a hot plate, a toaster oven and a small space heater when it was cold. I used no more than two 12 volt lights to light the space. I also learned that I could only use so much electric at any given time without blowing a fuse. I needed to make choices of using one appliance at a time and turn the others off when not using them. OH and lets not forget water usage. Living on land my 1 bedroom apartment provided me with free-flowing hot water at my fingertips whenever I wanted it. I never had to think about if I would run out of water, so I didn’t think about conserving it. After moving aboard, water was the first thing I had to think about. On the first boat, I didn’t have running water – I used dock water from a hose and filtered it or brought on bottled water. Visually being able to see how much water I had aboard definitely helped me conserve my use of it. So what do these reduction adaptations add up to? A much lower electric bill and possibly a lower negative impact on the environment. I have, whether I’ve intended to or not, fallen into a these new patterns just because of my lifestyle choice. If I observe and examine these habits a bit more closely and intently, (like the Cap and Trade asks me to) I may be able to make even more of a difference. As a newbie novice living on the water, I just skimmed the surface of the many ways living on a boat can be a sound environmental choice. I encourage and ask the experienced liveaboards, sailors, and boaters to comment and share their conservation tips and experiences while on the water. I really hope I can continue to live on the this lifestylefor a bit longer. I have become really fond of this choice and feel like there is so much more to learn. I am renting this boat till the end of the month and am hoping to find a new one in September so that I can stay on the water. Wish me luck! Thanks to Barbara and Jack Donachy for reading and commenting on my last post and sharing their fascinating life experience of living aboard. Very inspiring! To get a taste of what it would be like to live on a boat yourself check out Sleeponaboat.com. Greg, who runs this website, rents me the boat I am on now. He would like to connect both boat owners and individuals looking for a weekend stay or live aboard experience. I can only endorse this idea. I LOVE IT! 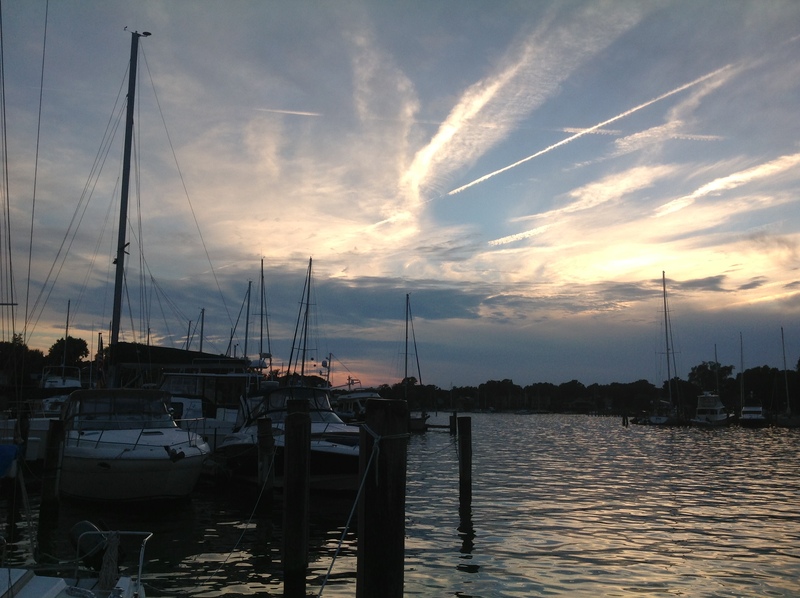 This entry was posted in Chapter three, Protagonist Post and tagged Adapting to living on a boat, Annapolis, Annapolis Maryland, Boat, Cap and Trade game, energy consumption, energy reduction, Environment, Lifestyle (sociology), Liveaboard, Living Aboard, Living Chapters, Recreation, water consumption, water usage on August 6, 2013 by Beth Barbush.